The Women Marines Association (WMA) is a professional organization for women who are Marines. It’s the only veterans association for and about women who are Marines. WMA is a non-profit 501(c)(3) veteran organization that helps veterans, educates the young people about the Marine Corps, and works to preserve the history of “Women of the Corps”. The Women Marines Association was established in Denver, Colo., in 1960 to ensure that our history as women Marines would continue to be told and passed on to a new generation of Marines. The Colorado chapter of the Women Marines Association was formed in 1974 as the Colorado Columbines Chapter or WMA CO-1 and remained a member of the national organizations group exemption as a 501(c)19 until 2008 when we incorporated and became a separate entity The CO Columbine-WM History Chapter, a 501(c)3 organization. We are part of the Women Marines Association and retain several names that we go by: Colorado Columbines, WMA CO-1, Women of the Corps, US Marine Memorial 5K and our official title CO Columbine-WM History Chapter. We abide by the National WMA bylaws and standing rules and support that organization as much as possible. The chapter hosted the WMA National Professional Development Conference and Convention in 2010 celebrating 50 years of Women Marines Association. The national association was formed in Denver in 1960 and the last living member of the formation committee was present for the opening ceremony. Sadly, Barbara Meeks passed away the next month. She was chapter president in 2001 and gave much to the organization. The chapter hosted the convention in 1990, also. In 2010 we created a Wounded Warrior fund and have used those funds to assist veterans in crisis. In each since then we’ve assisted men and women with various concerns from obtaining help from the VA; to finding housing and/or education; to helping to solve financial crisis; to providing gifts at Christmas; and through locating lost friends or honoring those who have passed away. We have provided “Quilts of Valor” on several occasions; support Gold Star Wives of America; and support initiatives of the United Veterans Committee of Colorado. 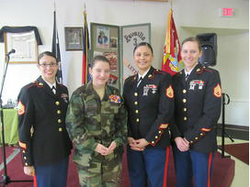 In 2004 the Colorado Columbines Chapter of the Women Marines Association (WMA) voted to collect as much history on women in the Marine Corps as possible and prepare a history exhibit. 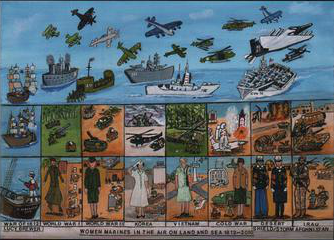 We had observed that eBay had a lot of WWII items for sale and thought that a tragedy. The exhibit opened at the Castle Rock Museum in August 2005 and was updated/changed until 2007 when the venue was no longer viable and the collection had grown beyond our wildest imagination. From August 2007 until June 2011 the chapter catalogued and organized the collection in climate controlled storerooms where it is housed today. We exhibited at the Marine Corps Expos on behalf of WMA, at WMA conventions, and at many other venues across the country. The President of our chapter and the Curator were successful in marketing this project and growing it to be THE definitive collection on the history of women Marines. So much so that the Curator received the Marine Corps Heritage Foundation's Julia Hamblet award for history preservation in 2010 and the WMA National Service Award in 2006. In 2010 the chapter hosted the 50th Anniversary of WMA Convention in Denver at the Grand Hyatt hotel. 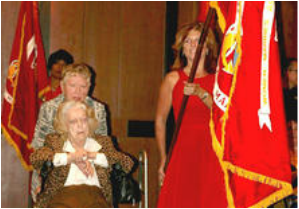 The Sopris Room became a museum for the event and was the largest exhibit of history on women in the Marine Corps ever presented. Our work has been showcased in Leatherneck Magazine several times. In June 2011 the Collection ownership was transferred to the National Women Marines Association to own and manage. It is our hopes that one day the collection will find a permanent home for all to see. The chapter will continue to support the collection, financially, as much as possible. ​This chapter is strong because of our auxiliary members, the Loyal Escorts of the Green Garter. They complete the chapter and assist in many of our projects. If you'd like to join us, but were not a Marine, this is how you do it! 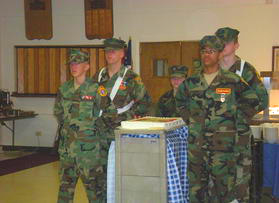 The Young Marines in the 1st Midwest Battalion assist the Women Marines Association and we provide assistance when needed. We instituted a “manners” lesson for the Buckley Field unit in 2005 and normally our National Historian, Nancy Wilt, does the lesson with our chapter as the backup. This prepares the young people for their YM Birthday Ball in October. The Young Marines are a non-profit Youth Organization and serve the Aurora, Colorado surrounding area. The Buckley Field unit meets every Tuesday evening at the Army National Guard Armory on Potomac St. in Aurora. Their staff is made up entirely of volunteers. These volunteers are former, reserve and active military members and civilians.